Some of my favorite travel moments are those that were completely unplanned, unexpected, and that ended with a BANG! 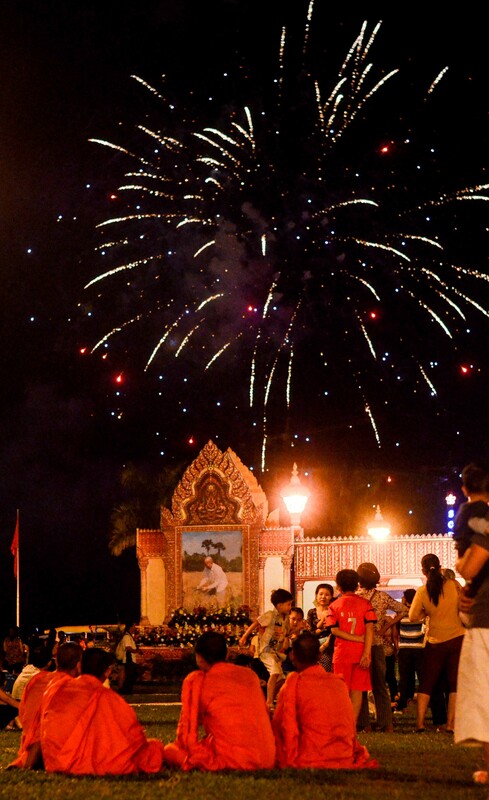 The evening pictured here fits that description to a T. For three days (May 13-15), Cambodia’s capital of Phnom Penh celebrated King Norodom Sihamon’s birthday with nightly fireworks shows in front of the Royal Palace. It just so happened that Terra (I’ll explain who he is later) and I stumbled upon these fireworks at the end of his first full day in the country. This group of monks enjoyed the show from the great lawn along the Mekong River and I couldn’t help but snap a few frames.